Wrap yourself up in this beautiful chunky knit cowl scarf this fall as the weather turns cool. Believe it or not autumn is only a short stint away, temperatures are dropping and the sun is setting a little earlier each night. It’s almost time to dig out all those soft chunky knit scarves & cozy sweaters we have stashed in the back of closets and buried in bottom of our drawers. I’m trying hard to resist the urge to pack up my favourite pair of leather flip flops and that cute sundress I didn’t get a chance to wear over the summer. Anyone who knows me will share that I am all about wearing what’s comfortable and let’s face it, there is nothing more wonderful than wrapping yourself in a soft fuzzy wool. The homemade chunky knitted cowl is a unique and easy trend not to be missed. Perhaps your crafty like me which means it’s time to dig out those knitting needles and knit a beautiful one of a kind chunky knit cowl just for yourself. I must warn you…chunky cowl knits are addicting once you get started. It took me 3 days of casual knitting to finish this scarf for my daughter and I just picked up two more skeins of wool to start on another for my youngest. It’s just been in the last few days that I have started to notice the leaves are changing colours and the bold yellows, brilliant oranges and bright reds are all around us. Autumn is probably one of my favourite season but it goes by so quick here. I’m holding off for as long as I can because I know when I drag all of our knits out of the closet and toss it in the washer to “freshen them up” it’s going to snow (in the summer every time I get my van washed it rains) and I am not ready “to build a snowman” just yet. Summer is slipping away and Autumn is only a short stint away, temperatures are already starting to dip and we have entered that awkward multi seasonal dressing that Albertans love to hate. It’s cold enough in the morning for a sweater and blue jeans yet by lunch time you’re want to slip on a pair of flip flops and shorts. Although the thoughts of snowstorms, zero degree temperatures and icy conditions are not what we look forward to, why not focus on the brighter side.. fall fashion! But have you seen the price of scarves these days? Who spend $20 on a infinity scarf for an 8-year-old? Or a 4-year-old for that matter? Not this momma that’s for sure! With prices like those it not wonder I have a love hate relationship with clothes shopping. More hate than love but, strangely enough I don’t mind shopping so much when It’s for my kids. They aren’t subjected to harsh dressing room lighting and pretty much everything they put on their bodies fits exactly the way they were designed to fit. The pieces match perfectly and coordinate with other pieces making it easier for them to choose want to wear that day. Having said that I hardly ever shop so, it takes something as startling as realize the baggy blue jeans that my daughter got for Christmas are now Capri pants. Dang! it’s time to go shopping and of course the stores are over crowded and you can’t move around and all I want to do is pick out what we need and get out of there! Wishful thinking on my part but there they were elbows deep into the children’s accessories bin when we spied the most beautiful white chunky knit cowl. I fumbled to find the price tag hidden in the soft and warm wool and almost choked on my gum when I read the tag. $19.95. 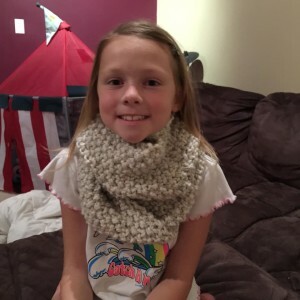 Who spend $20 on a knit cowl for an 8-year-old? Or a 4-year-old for that matter? Not this momma that’s for sure! I’m cheap but I’m crafty. My nana taught me how to knit years ago when I was just a little girl so,I decided the store could keep theirs and I would save $15.00 and knit one instead. Row 1- K1*,P1* across an odd number of stitches. BO, FO, leaving a 12 inch tail. Using a large darning needle and yarn like thread, sew short sides together with a half-twist to give a cowl an infinity loop. Here’s the finished knit Cowl I finished last night for my middle daughter…. Switch up your style by adding this Chunky Cowl knit this fall. I love the finished product. I just started trying my hands on knitting so this pattern will be a great help. Wow the finished product looks amazing. I love a good cowl scarf. It really adds a nice pop to an outfit! I don’t know the first thing about knitting. My daughter would like to try because her grandmother knits. Maybe I should try too. I wish I knew how to knit! Such a fun pattern. Oh how I need to start knitting! Thanks for the link for beginners! Your scarf is beautiful ;). Adorable and easy, I love it! Your Chunky Cowl is beautiful! I’m so happy that Autumn is right around the corner. You are so talented! I have always wanted to learn how to knit, I wonder if I would have the patience for it. Looks like your daughter is happy about your beautiful work! I can’t wait for autumn! Unfortunately, I am not crafty. 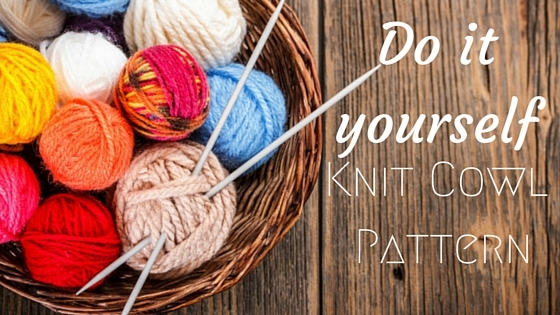 Knitting seems like a great skill to have–useful and fun! My daughter has taken up knitting and made a cute headband may even she would be ready for this now. Oh how I wish I could knit. I love the way the chunky cowl turned out. Your daughter is adorable and I bet she loves her new cowl. knitting is fascinating to me. the scarf looks really nice. good job. I envy knitters because I think it’s such a fun and useful skill to have. I’ve always wanted to make cute lil’ baby items. I have all the imagination for designs and such…but unfortunately no knitting skills – and it seems like something intimidating to learn. I love your cowl and I love the model! I miss knitting. I have so many knitting projects in mind, but never seem to get around to them. Thanks for the inspiration! I so wish I knew how to knit. My grandmother taught me how to do a basic crochet, but I’ve always wanted to learn more. What a beautiful cowl! I just moved from Hawaii to Maryland, so I’m patiently waiting for fall and scarves 🙂 I’ve been waiting for 3 years! I wish all the time I could knit or crochet! These are so awesome for the winter. My daughter loves to wear these and she just got into making fashion. I’ll have to show her this. Or you can save yourself the seaming and knit this up on a circular needle. (I do my utmost to avoid seams whenever possible!) This sounds like a great stash-buster, too! I wanted to but I couldn’t find circular needles big enough to do it! That looks so amazing and warm. I’d love to have one for me! This sounds like a good starting point for getting back into knitting. It looks super warm and would be fun to try and make! How fun! I have yet to knit a cowl! What a beautiful cowl! I’ll have to pass this along to my friends who know how to knit. More then a money saving idea, this is great because you personally made it just for her. Cant beat handmade gifts. I wish I could knit. I tried several years ago and I was a mess. I’m definitely going to try to make a cowl! I love scarves especially in the colder months (in Maine) and have one cowl that an aunt made for me. I love it and wear it all the time! My mom crochets blankets all the time. I unfortunately have never learned how. I am really liking this scarf perfect fro the cooler weather that’s coming. I love cowls! It’s really a great way to stay warm. and your little model looks so adorable! What a great cowl pattern! I hope you’re teaching your daughter how to knit! (and if you do, remember to cast on and knit the first row for her while she’s learning or she’ll get frustrated). Shes’s been asking but I wasn’t exactly sure how to teach her. Thanks for the tip! I wish I knew how to knit – my grandma is a pro and used to make us all manner of jumpers, blankets and toys. Plus, I wouldn’t have to spend on scarves and wooly hats if I knew! That is gorgeous. How talented you are to be able to make something like that! I love it.